I still need to switch out the lamp and figure out window coverings and sew new throw pillows, but the living room is starting to feel like a real room again. And the huge cracked mirror behind the artwork on the mantle . . .
. . . which we had to dismantle . . .
We know the mirror wasn't original to the house because it was stamped with "April '52" all over the back. Spackle, spackle, paint, paint, paint! Swap in the boy's couch for mine and grab the painting from the dining room. My grandma was stoked to see her clock over the mantle. I found this label in the attic when Greg and I tried to fix the noisy bathroom fan. 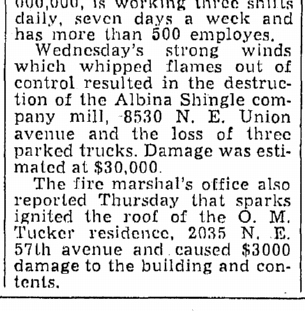 The last mention of the Albina Shingle Company in The Oregonian was on May 3, 1946 when the factory burned down. So I think that label dates from pretty close to when the house was built in 1938. It very likely came in the package with the original roof. Of course, these didn't go anywhere. I will not apologize for my Battlestar Galactica prints. What do you think? Are my modern pieces playing well with the boy's traditional couch or do I need to kick him out? OK, first of all, if you come home one day and that clock is missing, it's probably hanging in my living room. Second, I LOVE the idea of framing and hanging the shingle label! But most importantly: is that Greg's dog pillow there on the couch? Is it latch hook?? I like how you slipped into the photo without a word. Jess, can you believe that no one else in my family wanted that clock? My grandma was a little confused why I wanted it. 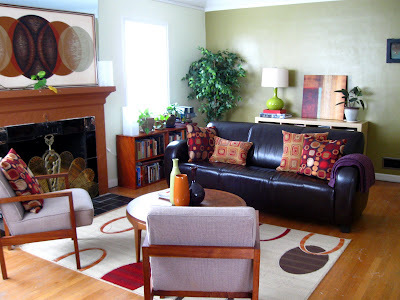 I think that the couch & the more modern pieces really do work well together. You should probably have a cocktail party, though, and invite me over so I can see in person. And, if the clock goes missing, it was definitely Jess. Amy, I'm thinking we need to do a Booze Tuesday at my place so everyone can weigh in on the situation. And I can't believe Audubon is recommending you cut down a mature tree! Are you going to do it? After looking at these pics for a few minutes, I'm digging that couch, actually! It's not my taste in particular, but I like the warm color and the fact that it looks so soft and inviting. Thanks, Anne! The couch is *really* comfortable and cozy--it's great for reading and watching movies. Anne, first of all I would like to tell you, you really did a remarkable job remodeling and redesigning this room. I just love it! In my opinion, there is no need to kick out your boyfriend's couch. I think it does fit well with the other decor. It's not like one of those heavy heavy old or even antique or rustic looking couches where old and modern really would clash. I don't know - it's my least favorite tree, but it is pretty in the winter (it's an English Holly). I'd have to settle for never being silver certified if I left it in. I totally agree re: Booze Tues at your place. That would be fun.